We use a 1 GHz femtosecond laser as a tool to perform coherent spectroscopy in an atomic vapor. The action of the ultrashort pulse train over the various velocity groups or over a selective group of rubidium atoms is probed by a diode laser using velocity-selective or repetition rate spectroscopies. In particular, we show that the 1 GHz frequency separation of the modes in the frequency comb allows distinguishing of the different hyperfine levels within the Doppler broadened profile. The data are in good agreement with numerical and analytical results. The frequency comb  generated from a mode-locked laser has been used for optical spectroscopy for at least three decades. The proposal and early experiments [2,3] highlighted a unique advantage of a mode-locked laser frequency comb: it provides, in a single laser beam, about a million optical modes with very narrow linewidths and a frequency separation equal to the repetition rate . The recent developments in stabilization of the repetition rate and of the carrier-envelope offset frequency  have allowed identifying the frequency position of the optical modes with accuracy better than one part in 1015 , thus providing a powerful tool for coherent control  and high-resolution spectroscopy . In most high-resolution atomic spectroscopy experiments, a cooled and trapped sample is employed [9,10] or a vapor in which a two-photon transition under counterpropagating beams is allowed , such that only one group of atoms, with specific velocity, is investigated as the femtosecond (fs) laser repetition rate is scanned. On the other hand, in systems with Doppler-broadening where coherent accumulation processes are present, velocity-selective spectroscopy is also possible . In this latter case, however, if the frequency separation in the comb is of the order of 100 MHz, as is usually used, the resolution is limited by the superposition of the hyperfine transitions . In this work, we use a rubidium Dopplerbroadening sample to show that the 1 GHz frequency separation of the optical modes allows us to distinguish the different hyperfine levels and also to investigate the coherent processes induced by the train of ultrashort pulses. Under the high repetition rate of the fs laser, the necessary condition for the coherent accumulation of population and coherence is much better fulfilled, and moreover, it enables the position of a single mode within the Doppler profile of the rubidium D2 or D1 line. A simplified scheme of the experimental setup is presented in Fig. 1. An fs pulse train generated by a mode-locked Ti:sapphire laser (BR Labs, Ltd.), with a repetition rate of 1 GHz, is used to excite one of the 5S1/2 → 5P1/2 or 5S1/2 → 5P3/2 transitions of an Rb vapor at 795 and 780 nm, respectively. A diode laser stabilized in temperature and with a linewidth of about 1 MHz, without an external cavity, is used as the probe beam. The two beams are overlapped, with orthogonal linear polarizations and in a counterpropagating configuration, forming a small angle in the center of a sealed Rb vapor cell. The vapor cell, kept at room temperature, is 5cm long and contains both 85Rb and 87Rb isotopes in their natural abundances. The Ti:sapphire laser produces 100 fs pulses and 300mW of average power, such that the power per mode is ≈ 60 μW. With a beam diameter on the order of 2 mm, the maximum Rabi frequency per mode, on the transition 85Rb 5S1/2, F = 3 → 5P3/2, F' = 3, is Ωm = 0.16γ, where γ is the relaxation rate of the excited states. The 1 GHz repetition rate is measured with a photodiode and locked to a local oscillator using a mirror cavity mounted on a piezoelectric transducer (PZT) to change the cavity length. The diode laser, operating at 780 nm, can sweep over 10 GHz by controlling its injection current. A saturated absorption setup and a Fabry–Perot cavity, with free spectral range of 300 MHz, are used to calibrate the probe detuning. The diode beam with a diameter on the order of 1mm and maximum power of 170 μW is detected after passing through the cell and a linear analyzer. Data acquisition is performed using a lock-in amplifier or through direct detection of the diode beam transmission. In the first case, a chopper provides the reference frequency and the lock-in signal represents the probe beam transmission variation induced by the fs pulse train. Although we always detect the probe beam transmission, the results were obtained through two distinct techniques: (i) velocity-selective spectroscopy , where the action of the fs laser is investigated over the various velocity groups of the atomic vapor (in this case, the repetition rate is locked and the diode frequency is scanned across the Doppler lines of the Rb) and (ii) repetition rate spectroscopy . In this technique, the diode laser has a fixed frequency, and the action of the fs laser is investigated only over the atom groups that are resonant with this frequency. Figure 2 shows the transmission variation of the diode laser beam induced by the fs pulse train, ΔT (middle curve), as a function of the diode frequency for the four Doppler lines of the 5S1/2 → 5P3/2 transition. This signal is processed by a lock-in amplifier, so that the Gaussian profile of the Doppler lines is eliminated. 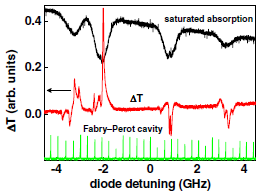 We also display the saturated absorption signal (upper curve) and the output of the Fabry–Perot cavity (lower curve), which are detected simultaneously with the diode transmission through the cell. These two curves allow us to identify which hyperfine transitions are being investigated. For these measurements, the central wavelength of the fs laser (λfs) is also tuned to 780nm and the two Rabi frequencies are Ωdiode = 0.36γ and Ωm = 0.16γ for the same transition 85Rb 5S1/2, F = 3 → 5P3/2, F' = 3. The number of peaks observed in the ΔT signal depends on the number of hyperfine transitions driven by the fs and diode lasers in each Doppler line. Moreover, positive (negative) peaks indicate that the population of the probed state decreases (increases) due to optical pumping processes. For this measurement, in particular, the Rabi frequency of the diode laser is greater than the Rabi frequency per mode, so the optical pumping process is dominated by the diode laser . 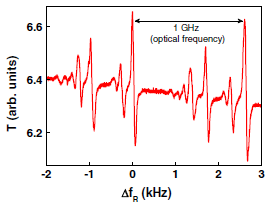 It is important to note that, whereas for a fs laser with repetition rate around 100MHz all the hyperfine transitions in one Doppler line appear superposed in a single peak , in the case of the 1 GHz Ti:sapphire laser it allows us to investigate with more details the resonances of the optical modes of the pulse train with the atomic levels of the system. In fact, as shown in Fig. 3(a), all transitions in 85Rb 5S1/2 → 5P1/2, driven by the 1 GHz laser with Ωm = 0.13γ (F = 3 → F' = 3), can be well resolved. The ΔT signal is obtained as the diode laser, with Ωdiode = 0.08γ (F = 3 → F'' = 3) is scanning the Doppler line 5S1/2, F = 3 → 5P3/2. A simplified scheme of the relevant level structure is presented in Fig. 3(b). For the D1 line, the 1 GHz laser interacts with a four-level system, resulting in four resonances with the modes of the frequency comb. Moreover, the diode beam probes these resonances in three different transitions of the D2 line: F = 3 → F'' = 2, 3, 4. These resonances explain the two similar sets of six peaks (positive and negative), separated by 362 MHz, shown in Fig. 3(a). Each pair of positive and negative peaks, 36 MHz distant, reflects the optical pumping induced by the 1 GHz laser between the two hyperfine levels of the ground state 5S1/2. 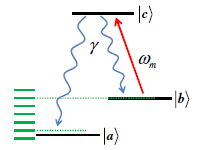 The observed linewidths are dominated by the power broadening due to the two lasers, although the laser drifts and the magnetic field broadening in the unshielded Rb cell also contribute to the width. All referred transitions can be seen in the frequency domain scheme depicted in Fig. 3(d) for one velocity group, where the bars in the bottom (top) indicate the modes of the frequency comb (transitions of one atom). We note that only two modes (m and m þ 3) of the frequency comb actually induce these transitions in different groups of atoms. Further, the position of these modes inside the Doppler profile can be seen by detecting the diode beam transmission without the lock-in amplifier, as indicated in the inset of Fig. 3(a) (see arrow). where we have already added the two resonance conditions. The first term represents the solution of the Bloch equations for a three-level lambda system with the cw laser near the a → c transition, while the other two terms correspond to the solution when the cw laser is resonant with the b → c transition. rho_ii is the population of state jii in the absence of the cw field, Ωi,c and δc,i are the Rabi frequency and the detuning of the cw laser with respect to the i → c transition, i = a, b, respectively. We also take into account the finite interaction time due to the escape of the atoms from the interaction region including the relaxation rate Γ. This analytical solution is used to describe the interaction with the two excited hyperfine levels, 362MHz distant, each one with its electric transition dipole moment. As the diode beam probes these resonances in three different transitions, we add them weighted by their electric transition dipole moments. Figure 3(c) shows the analytical result for the population variation, ΔTcalc, of the state 85Rb 5S1/2, F = 3. The solid curve was obtained for Γ/2π = 10 kHz, γ/2π = 5 MHz, ΩF;F' = γ=5 × sqrt(SF;F), where SF;F' is the relative strength of each of the 85Rb 5S1/2, F → 5P1/2, F' transitions , and assuming that the two lowest hyperfine levels are equally populated. We also considered the detuning, δ/2π, with relation to the 85Rb 5S1/2, F = 3 → 5P1/2, F' = 2 transition and write δFF' = δ for F = 3 and F' = 2, and δFF'/2π = δ/2π + 36 MHz for F = 2 and F' = 2. We can see that the analytical solution of this very simple model gives a good agreement with the experimental results, including the relative intensities of the peaks. It is interesting to note that although we had not stabilized the offset frequency of the fs laser, we can well describe the optical processes considering the interaction of the atomic vapor with the frequency comb. We can also compare our results with a direct numerical integration of the Bloch equations for a three-level system interacting with a train of fs pulses . The state jai population variation obtained by this numerical calculation, for one pair of positive and negative peaks, is also presented in Fig. 3(c) (filled circles). Again, the good agreement indicates that the train of fs pulses can be well described by a set of cw lasers phase locked with a frequency separation equal to the repetition rate. The interaction of the atomic vapor with the 1 GHz laser can also be investigated using the repetition rate spectroscopy. In our experiment, we keep the diode frequency fix inside the Doppler line 5S1/2, F = 3 → 5P3/2 of 85Rb and detect the diode beam transmission as a function of the repetition rate of the Ti:sapphire laser for λfs tuned to 800 nm. In this configuration, only the atoms that are resonant with the diode frequency are investigated, so the Doppler broadening does not appear and we can detect directly the transmission of the diode beam. The experimental result is shown in Fig. 5 for Ωdiode = 0.05γ (F = 3 → F'' = 3) and Ωm ¼ 0.12γ (F = 3 → F' = 3). By modulating the mirror of the ring laser cavity with the PZT, we can sweep the mode frequencies over the 85Rb 5S1/2 → 5P1/2 transitions. As discussed before, two modes, m and m + 3, induce optical pumping between the hyperfine levels of the ground state, with this process involving the two excited hyperfine levels. Moreover, when one mode interacts with the atoms that are also in resonance with the diode, we observe a variation in the diode transmission. Therefore, we obtain again the two sets of six peaks (positive and negative) related to each transition. If we continue to sweep the mode frequencies, the signal will repeat itself at intervals of Δf_R ≈ 2.6 kHz, corresponding to a change in the one-photon transition of ≈ 1 GHz (repetition rate), as shown in Fig. 5. In conclusion, we have shown that coherent processes such as the optical pumping between hyperfine levels of rubidium atoms can be well resolved using a 1 GHz fs laser. The action of the ultrashort pulse train over the various velocity groups or over a selective group of atoms is probed by a diode laser using two distinct techniques: velocity-selective spectroscopy and repetition rate spectroscopy. The experimental results are also compared with those obtained by an analytical calculation and a direct numerical integration of the Bloch equations. The good agreement indicates that the optical processes are well described by the interaction of the atomic vapor with a frequency comb. We acknowledge helpful discussions with D. Felinto and L. H. Acioli, and we thank G. D. Carvalho for help in setting up the experimental apparatus. This work was supported by the following Brazilian agencies: the National Council for Scientific and Technological Development, the Fundação de Amparo à Ciência e Tecnologia do Estado de Pernambuco, and the Coordenação de Aperfeiçoamento de Pessoal de Nível Superior. 1. Th. Udem, R. Holzwarth, and T. W. Hänsch, “Optical frequency metrology,” Nature 416, 233–236 (2002). 2. Y. V. Baklanov and V. P. Chebotayev, “Narrow resonances of two-photon absorption of super-narrow pulses in a gas,” Appl. Phys. 12, 97–99 (1977). 3. R. J. Teets and T. W. Hansch, “Coherent two-photon excitation by multiple light pulses,” Phys. Rev. Lett. 38, 760–764 (1977). 4. A. Bartels, C. W. Oates, L. Hollberg, and S. A. Diddams, “Stabilization of femtosecond laser frequency combs with subhertz residual linewidths,” Opt. Lett. 29, 1081–1083 (2004). 5. D. J. Jones, S. A. Diddams, J. K. Ranka, A. Stentz, R. S. Windeler, J. L. Hall, and S. T. Cundiff, “Carrier-envelope phase control of femtosecond mode-locked lasers and direct optical frequency synthesis,” Science 288, 635–639 (2000). 6. W. H. Oskay, S. A. Diddams, E. A. Donley, T. M. Fortier, T. P. Heavner, L. Hollberg, W. M. Itano, S. R. Jefferts, M. J. Delaney, K. Kim, F. Levix, T. E. Parker, and J. C. Bergquistk, “Single-atom optical clock with high accuracy,” Phys. Rev. Lett. 97, 020801 (2006). 7. M. C. Stowe, A. Pe’er, and J. Ye, “Control of four-level quantum coherence via discrete spectral shaping of an optical frequency comb,” Phys. Rev. Lett. 100, 203001 (2008). 8. J. Ye and S. T. Cundiff, Femtosecond Optical Frequency Comb Technology: Principle, Operation and Application (Springer, 2005). 9. A. Marian, M. C. Stowe, J. R. Lawall, D. Felinto, and J. Ye, “United time-frequency spectroscopy for dynamics and global structure,” Science 306, 2063–2068 (2004). 10. M. Maric, J. J. McFerran, and A. N. Luiten, “Frequency-comb spectroscopy of the D1 line in laser-cooled rubidium,” Phys. Rev. A 77, 032502 (2008). 11. 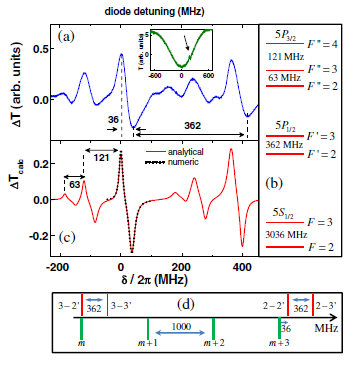 J. E. Stalnaker, V. Mbele, V. Gerginov, T. M. Fortier, S. A. Diddams, L. Hollberg, and C. E. Tanner, “Femtosecond frequency comb measurement of absolute frequencies and hyperfine coupling constants in cesium vapor,” Phys. Rev. A 81, 043840 (2010). 12. D. Aumiler, T. Ban, H. Skenderović, and G. Pichler, “Velocity selective optical pumping of Rb hyperfine lines induced by a train of femtosecond pulses,” Phys. Rev. Lett. 95, 233001 (2005). 13. T. Ban, D. Aumiler, H. Skenderović, S. Vdović, N. Vujičić, and G. Pichler, “Cancellation of the coherent accumulation in rubidium atoms excited by a train of femtosecond pulses,” Phys. Rev. A 76, 043410 (2007). 14. L. Arissian and J.-C. Diels, “Repetition rate spectroscopy of the dark line resonance in rubidium,” Opt. Commun. 264, 169–173 (2006). 15. M. Polo, C. A. C. Bosco, L. H. Acioli, D. Felinto, and S. S. Vianna, “Coupling between cw lasers and a frequency comb in dense atomic samples,” J. Phys. B At. Mol. Opt. Phys. 43, 055001 (2010). 16. D. A. Steck, “Rubidium 85 D line data,” http://steck.us/alkalidata. 17. M. P. Moreno and S. S. Vianna, “Coherence induced by a train of ultrashort pulses in a Λ-type system,” J. Opt. Soc. Am. B 28, 1124–1129 (2011).